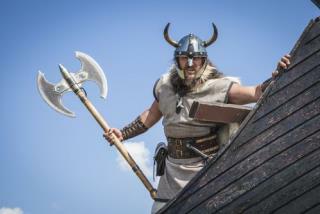 Scientists Dig Up Viking Stronghold: Archaeologists have excavated a rare find in Denmark: a Viking fortress. It's the first such discovery in more than 60 years, and researchers were clued in to its possible existence after examining the placement of fortresses nearby. "It was clear that there was a fortress missing," says researcher Søren Sindbæk. His team investigated the area using archaeological technology, developing something called a "ghost image" of the fortress using magnetic data. A Large Narwhal Tusk Might Mean Another Body Part Is Bigger, Too: The narwhal's distinctive tusk is actually a tooth, one that can grow to nearly 10 feet in length. It's almost never found on females, and researchers have a new theory why: It may communicate a male's fertility to its tuskless counterparts. And how do they know that? Well, after poring over anatomical measurements taken of 144 narwhals that were legally killed by Inuits between 1997 and 2008, they discovered what Phys.org terms a "very clear correlation" between tusk length and the size of a ... different part of the narwhal's anatomy. 3 New Mushroom Species Discovered Where You'd (Maybe) Least Expect It: That scientists discovered three new species of mushrooms isn't all that unusual—that they did so in a place that people frequent every day is why it's making headlines. When scientists in London used a technique known as DNA barcoding to attempt to match the DNA profiles of the dried mushrooms to known species, they discovered that three of the 15 pieces they tested were previously unknown to science. They just hadn't figured on finding Boletus meiweiniuganjun, Boletus bainiugan, and Boletus shiyong where they did. Antarctic Fish's Veins Keep Them From Freezing to Death: How do the fish that thrive in the waters around Antarctica prevent their blood from turning to ice? Scientists have long known that the group of fish species known as notothenioids have an antifreeze protein in their blood that prevents them from succumbing to the icy temperatures, but new research has revealed that the same protein does something else that helps stave off death. Century-Old Time Capsule Discovered Inside a Head in Boston: A lion statue perched atop the Old State House in Boston has been hiding a secret for 113 years: He's got a time capsule inside his head. When the lion came down for restoration, authorities with the Bostonian Society used a tiny camera to peer inside and confirm an old city rumor: Inside is a sealed copper box that went up with the lion in 1901. Now the tricky part: How are they going to get it out without destroying the lion?